The March/April issue of Physicians Practice magazine includes a center section devoted to Upstate Medical University, Upstate University Hospital and Upstate University Hospital at Community General. 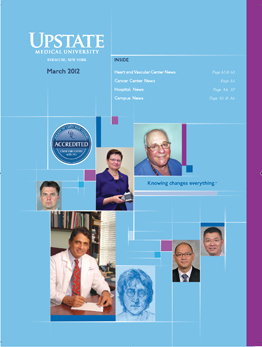 Featured are Gregory Fink MD and Upstate’s accredition as a chest pain center; Tamas Szombathy MD on cardiac ablation; Dilip Kittur MD and Krit Kitisin MD on liver cancer treatment; Dianbo Zhang MD on using tPA for severe frostbite; Margaret Turk MD and Lynne Logan PT, PhD on their study of a foot drop device; Upstate’s participation in Joining Forces; the scholarship honoring N. Barry Berg PhD; and David Halleran MD’s memories of trying to save John Lennon’s life in 1980. View the Upstate section of the magazine on line.